What girl has not dreamed about meeting a prince and falling in love? Judging by the number of movies and books (and the fascination with Prince William and Kate) that touch on this theme, this prince-meets-ordinary girl tale is not going anywhere soon. A Royal Pain by Megan Mulry follows this well-trod story line and injects it with humor, some steam, and some all too real complications. Bronte Talbott is a typical American career woman looking for love in New York. She enjoys the royal gossip rags, fashion, and her job in advertising. When she meets a man that she calls Mr. Texas at a friend’s party, she falls hard and fast for his drawl, his energy, and his lavish attention. His “I love you” to her results in a cross-country move to Chicago, where Mr. Texas turns out to be Mr. Wrong. Bronte, having learned that love does not conquer all, doubts her own decision making ability with men and desires to be savvier the next time she meets a man. She builds emotional walls three feet high. Enter Max Heyworth, a doctoral student at the University of Chicago. The serious yet fun man appeals to Bronte, and she demands total honesty. Max does not provide this honesty at first, but when he does Bronte realizes she has real problems. Max is a duke, and any future with him will be infinitely more complicated than Bronte thought it would. The first third of this book was my favorite part. She learns quite a lesson from her first stab at love with Mr. Texas. As a reader, I knew that his lines and promises were untrue, and I just wanted to scream at Bronte. “Run the other way!” Bronte, with her issues with her family, her work, and learning how to love was charming and fun. When the relationship with Mr. Texas ended and Bronte met Max, I thought for sure that the story was on an enchanting trajectory. Max is pretty much the perfect royal: handsome, smart, thoughtful, and a little bit of a rebel. The beginning of their relationship was great. But Bronte’s issues came roaring into this relationship. She does not want Max to get angry with her—even when she is being dumb. She does not want to feel tied down—despite the feelings she has for Max. She does not want to disrupt her life for a relationship that might not work. Frankly, her issues, while understandable at first, became exhausting the more I read. I found myself wondering why Max wanted to be with her at all. When both Max and Bronte end up in England, there was some fun with Bronte meeting Max’s family. I enjoyed his brothers and sisters and wished that there were more scenes with them. I particularly enjoyed his younger brother, Devon, and his bohemian sister, Abigail. Max’s frigid mother was also a lot of fun. I wish her thawing-out would have taken a bit longer. She had the potential to be a scene-stealer. The last third of the book involves Bronte trying to figure out what her life will be like as Max’s wife, but Bronte completely exhausted me with her emotional walls and issues. This part of the book felt like I was slogging through quicksand. At one point, I nearly wished that Max would leave her just so that she would stop talking. While I think it is admirable of Mulry to make Bronte a warts-and-all heroine, toward the end of A Royal Pain I was tired of hearing about her warts. I just wanted my happy ending. I’m glad Max had more patience with her problems than I did. 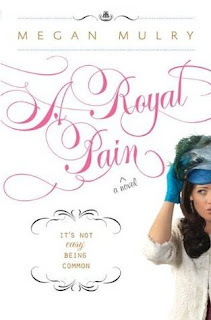 Overall, A Royal Pain was a fun, steamy, and entertaining read. I just needed the heroine to get over herself a little more quickly than she did.